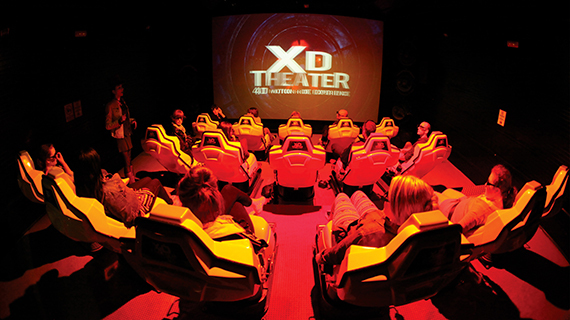 The XD Theater features the best seat simulator in the industry and offers an unparalleled, multi-sensory, immersive experience by combining 3D stereoscopic graphics with visual effects. Triotech’s XD Theater is scalable from 4 to over 100 seats depending on operator needs, anticipated customer traffic, and space allocation. The XD Theater comes with a self-sustaining structure or can be fitted inside an existing installation. Our systems afford optimized efficiency thanks to high throughput. This 4D motion simulator theater is a great revenue generator. Each year, we make new immersive ride films available for Triotech’s XD Theater. Whether it’s set in the wild American West, the merciless frozen tundra, or a prehistoric world, there is sure to be an adventure that will thrill your audience and ensure strong recurring revenue! Welcome to Dino Safari! You expected a quiet tour? No way! A poacher kidnapped a baby dinosaur, let’s pursuit him in a high-speed race! Will you survive a barrage of deadly dinosaur encounters to free the captive creature and escape? From his laboratory to a terrific chase in an old abandonned roller coaster, you’ll live a frightenning and unforgettable journey! This horrific 3D roller coaster ride is perfect for Halloween! Experience a powerful race on your state-of-the-art hover bike and compete for poll position! While you’ll drive through the city, tricky terrains and landscapes, beware of the obstacles and demonstrate your driving skills! Push your limits to the finish line! 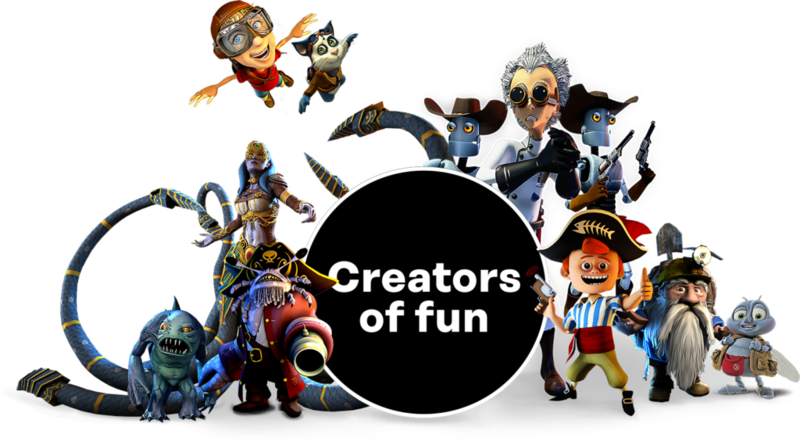 Experience a thrilling adventure with our mad professor! His giant robot Machinarum is out of control! Only the most intrepid adventurers will dare to face him, protect themselves from hot steam and avoid the menacing machines! Try shut the robot down before it’s too late if you want to survive this perilous journey! What happens at night at the toy store? 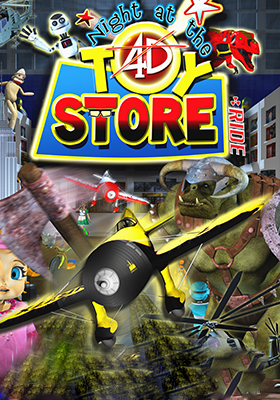 Fly with your vintage plane through the store and avoid the chaos created on every floor by all the toys! Will you be able to escape from the dinosaurs and King Kong? Fasten your seatbelts and let’s the adventure begin! Welcome to Pirate Rapids! Begin from the mountaintop and ride the vertiginous water slide through the jungle park. Plunge underground to a ghost town inhabited by hostile skeleton pirates. You must fight your way out but beware of the exit path you choose! Thrills included! Follow the rats in an unexpected race though a house and its underground meanders! Beware the traps, put the pedal to the metal and hold on tight! Pilots of jet-powered flying cars compete a thrilling 600mph race through the merciless desert . 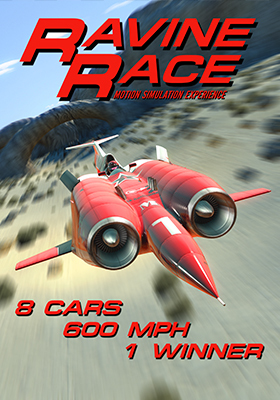 This high-octane race will bring them through spectacular caynons and rivers. Who will be the ultimate winner in this action packed challenge? Welcome to a crazy world where pigs run the farm! There is a crazy hog farmer running loose on his tractor. He is joined by a whole clan of characters as they barrel down the road Dodging vehicles and obstacles. Through the fields and off the cliff. Let’s get on the train track! Race through snow-covered mountains. This is one wild, icy ride that will give you thrills and chills. XD Theaters have a high customer satisfaction rate in the industry.